Have you ever had days where you doubt yourself? Who hasn’t right? Especially as a young child or teenager trying something for the first time. It can be hard to have the self-confidence in yourself to believe that you will succeed. This unicorn self-confidence poster is FREE from Growing Play and it helps to remind us all to believe in ourselves. Download it at the bottom of the post. This free poster is from the complete Unicorn Positive Affirmation and Growth Mindset Poster collection. It includes 25 unicorn themed posters to brighten your day and create a positive mindset. If your children (or yourself) suffer from low self-confidence, they may be stuck in some negative mindsets that are affecting the way they think about themselves. Children and especially teenagers can get stuck in a negative mindset leading to a lot of “always” or “never” talk, creating a sense of entrapment and hopelessness. It is important to encourage children to change from a negative to a positive mindset. Here are some examples of negative mindsets that can lead to low confidence. Thinking this way can keep them from trying again, or even trying something for the first time. It makes it only too easy to give up. When someone lacks self-confidence, it can give them a feeling of being all alone. They can feel isolated and assume that others have their lives together while they are still floundering. When someone lacks confidence, they may feel like they don’t have anything of value to contribute, whether it’s at school or home. No one fails at every single thing; but to a person with low self-confidence, it can sure seem that way. Sometimes, they can feel like everything they’ve ever tried has failed, even if this is not true. Do your children see someone else with a successful life and wish they had the same? Instead of being inspired and wanting to improve their experiences, they look at that person and get depressed, thinking they could never achieve what they have. How Can These Mindsets Be Overcome? In order to overcome these destructive mindsets that lead to low confidence, it’s necessary to reprogram thought processes. Teach the students to pay attention to negative self-talk and immediately change it to something positive. Here are several examples to change from a negative to a positive mindset. Encourage children to change from a negative to a positive mindset by using a growth mindset. A growth mindset was developed by psychologist Carol Dweck who explains mindset as a self-perception or “self-theory” that people hold about themselves. For example, it is believing that you are smart or not smart, good athlete or bad athlete, good at knitting or stink at knitting. This type of mindset can have a profound effect on learning achievement and skill acquisition. Overall, her research revealed that when students learned through a structured program that they could “grow their brains” and increase their intellectual abilities, they did better. In addition, having children focus on the process that leads to learning (like hard work or trying new strategies) fosters a growth mindset and its benefits. A growth mindset is not just about effort. Children need to apply effort of course, but they also need to discover new strategies and ask for help when needed. This helps students to face challenges head-on and understand that setbacks occur on the path of learning. Remind children it is okay to ask for help to overcome a negative mindset. But like everything else in life, you can do it if you set realistic goals and have confidence in yourself! Start right away to create a positive mindset and hang up this FREE Unicorn Self-Confidence Poster – I believe in myself. 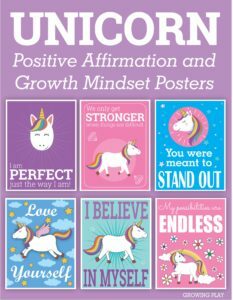 The digital download Unicorn Positive Affirmation and Growth Mindset Posters include 25 posters to encourage a positive mindset and outlook on life. 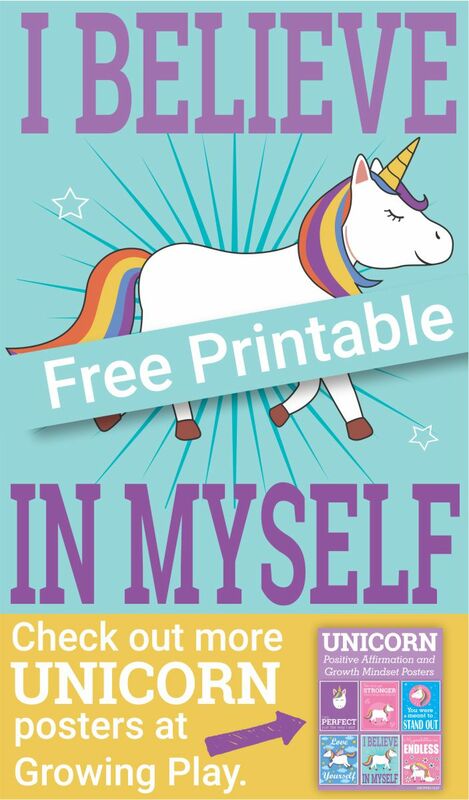 Boost self-confidence and improve your mindset with these full color 8.5″ by 11″ posters to print and hang up in a classroom, bedroom, playroom or anywhere a unicorn lover hangs out! FIND MORE Motivational Posters and Cards here.